KENAI — Eighteen months ago, Eli Darien walked out of Wildwood Correctional Complex in Kenai for the last time. He’d been in and out of the prison every few months for years, largely on drug offenses, beginning with marijuana and eventually progressing to heroin. Each time he got out, he’d violate probation or reoffend, winding up back in front of the judges and back in a jail cell. There were times, too, in the depth of addiction to drugs, he’d offend on purpose, he said. That changed when he entered the Henu’ Wellness Court. On Oct. 6 he marked 18 months of complete sobriety. The program, a joint-jurisdiction wellness court between the Kenaitze Indian Tribe and the state, offers an intensive course of justice and wellness to participants. Most of those involved have a substance abuse problem, regardless of whether the particular crime was for driving under the influence or theft. Darien was one of the court’s first participants. It officially began in 2016, and now Darien and Dale Vaughn will graduate by the second week of October, the program’s first graduates. Moran, who has since retired from the court, was the one who recommended him to the Henu’ program. Kenaitze Indian Tribe Chief Judge Susan Wells said watching the transformations in participants like Darien has been a remarkable part of the program. She was part of the original team of people who drafted the idea for the wellness court in Kenai. The idea came from the example of a joint-jurisdiction court in Minnesota, led by Cass/Itasca County Judge John P. Smith and Leech Lake Band of Ojibwe Tribe Court Judge Korey Wahwassuck. Frustrated by recidivism rates in his court, Smith approached Wahwassuck and the two worked out a joint-jurisdiction wellness court intended to produce better outcomes for participants, particularly children and families in the child welfare system. The state has a number of wellness courts, but the Henu’ Wellness Court is the first Tribal-state joint-jurisdiction court in Alaska. It’s thought of as a state court with a Tribal track, but the Tribe wants it to be recognized as a Tribal court with a state track, Wells said. Participants like Darien are referred to the court based on the type of conviction and history they have, including substance abuse or domestic violence. There are certain types of cases Henu’ won’t take, depending on the offense, Wells said. Court takes place in a square room on the Kenaitze Indian Tribe’s campus in Old Town Kenai, where participants sit less than two feet across a long table from the judges and talk about their cases and their progress. It’s very different than state court, where the judges sit far from and above defendants on a podium, Darien said. The attorneys still participate with each hearing; the state District Attorney in Kenai attends hearings as well. “I think it’s profound to have that interaction (directly) with a judge,” Wells said. Based on a series of Kenaitze Indian Tribe values, the participants move through four phases on their way to graduation. They submit to urine analysis every day, meet with probation officers, attend court once a week and go to substance abuse and recovery groups. It’s an intensive program that lasts a minimum of 18 months, Wells said. The Tribal court building is about 100 feet from the Tribe’s massive health care complex, the Dena’ina Wellness Center, which makes it easier for the participants to walk over and get care in connection with the court, Wells said. It hasn’t always been easy for participants like Darien, but the effect of being sober is noticeable. He says he wouldn’t go back now. Vaughn, who was the first participant in the court, agreed. People notice when you’re sober, he said. He and Darien agreed that anyone going through addiction has to be ready to quit; the program helps, but they have to be ready. Much of the work of recovery is incumbent on the participants themselves as they progress through the court. People can drop out if they fail to meet the benchmarks, but so far, watching the transformation in people like Darien has been heartening, Wells said. Beth Freeman recently entered the program. She said coming to Henu’ Wellness Court after going through the state court offers a sense of turning a corner. Wells said the tribe is working a grant for a peer support program so graduates like Darien and Vaughn can continue to provide support as more than volunteers for the people still working their way through the program. That kind of support is key to the nature of the program, she said. “It’s really like we’re wrapping our arms around someone,” she said. During a Kenaitze Indian Tribe general meeting Oct. 6, Darien spoke with the Tribal council and members attending about the court. Wells said he’s already been invited to speak at another Tribe about sobriety, and he’s working through his classes to become a substance abuse counselor at the Dena’ina Wellness Center. 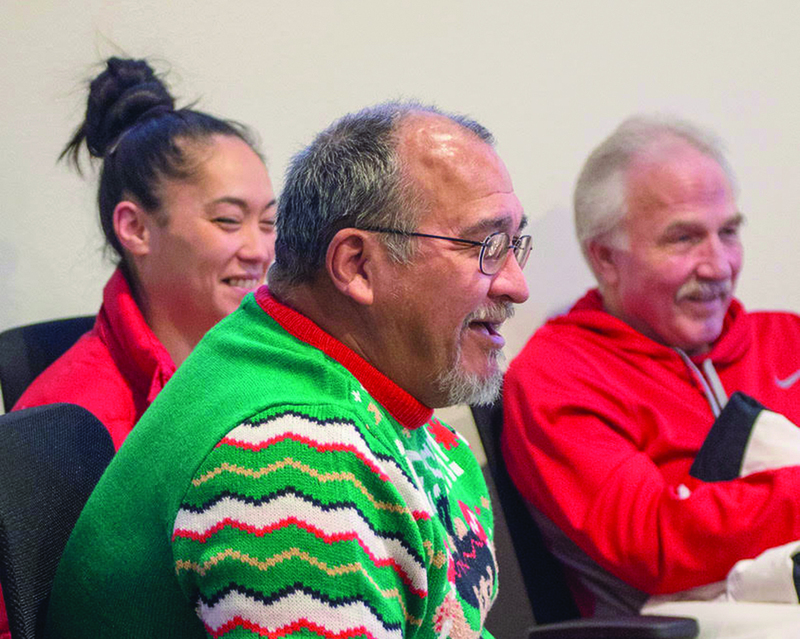 Having lived all his life in Kenai, he knew virtually every person in the room — “this is a room full of cousins,” he said — and many of them knew what he had been through. As he walked back to his seat, a number of people stood and applauded enthusiastically, offering him high-fives or emotional hugs as congratulations on how far he’d come.